What’s reviewed here is a simple system on the face of it. Five identical loudspeakers, and two more giant subwoofers stacked on top of one another, sporting large forward-firing drivers and twin ports. To be exact I had five of the Focal Viva Utopia LCR enclosures, except that one had its central circular baffle rotated so that the central midwoofer and tweeter were on the same axis as those on the four corner upright speakers. This makes it become the ‘centre’ model; that and being mounted upon a shorter stand to fit under your screen. For extreme bass duties, I had two stacked passive woofers, dubbed the Utopia Sub EM. Yes, above a certain level with subwoofers you do tend to get speakers in enclosures that you combine with rack-mounted amplifiers. Not that the likes of Paradigm and Velodyne don’t supply stupefyingly powerful amplifiers inside their active products, but it’s just how it’s done at this super high-end of the market. Before I go on, I’ll run you through the rest of the demonstration system that formed the backbone of my Viva Utopia audition – because when you’re playing with £61,000 worth of loudspeakers, it’s obvious you won’t be using a Tesco DVD player. 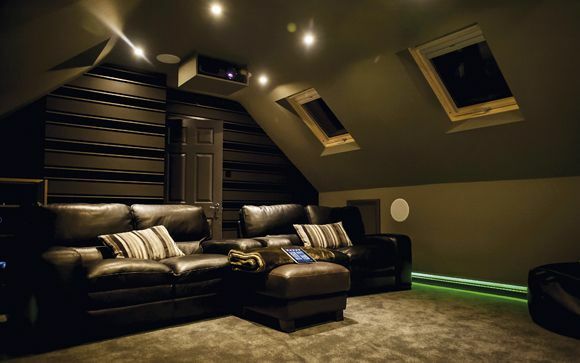 In fact, the rest of the electronics specced for my demo added another forty-odd thousand quid onto the system price, creating a £100,000+ fantasy package of unrivalled home cinema heaven. Blu-rays and CDs were spun upon an Oppo BDP-95EU Audiocom Signature edition (£3,000), flanked by an Anthem Statement D2V pre-amp (£8,750) and seven Anthem Statement M1 power amplifiers, one for each of the speakers. These crank out 1,000W and cost £3,500 each. Completing the setup was one of SIM2’s Nero 2 projectors, yours for a cool £18,000. You won’t be surprised to learn that the whole experience was goosebump-raisingly intense. This was, after all, a foray into the High-End Hero zone. Now I’ve been lucky enough to visit a £1,000,000 pro-install in the past and wrapped ears around £120K worth of JBL Synthesis speakers. But I’m not Jeremy Clarkson. He gets to test the finest cars at any price, and then gets to own them as well. So although I have tested systems up to £20,000 in value in speakers in my home, I will never, ever be able to actually buy the likes of this stuff. Being exposed to it, over and over, until you are in fact the mag’s go-to-guy to check out the sexiest high-end kit on the planet, can in fact be a bit double-edged. I get it, I love it... but it hurts like hell to walk away afterwards! So what’s it like? One hundred thousand pounds’ worth of cinema sound? Sixty grand of speakers? Well, for one, it’ll be tailored. Tailored to your room and to your taste as well. So much so that after a little run through of a favourite clip, I’m afraid I had to wrest the remote from my host and – purely in the interests of science – sail out towards the edge of the envelope and crank up the volume. Now while each territory or country tends to have its own flavour of loudspeaker engineering – mad, brash, boom from the likes of Cerwin Vega in the US and analytical precision from the German brand Teufel – for instance, the French are known as gourmands, passionate artists and lovers. It’s the sort of country where the pursuit of utter deliciousness, even at the cost of digging up half the Périgord with a pig called Petain for a fungus, is deemed sane and worthy. I will admit now that I have scored this system with a full five points in every category, despite the tuning not being to my taste. The chaps who set it up were terminally grown-up and didn’t allow the subwoofer enclosures to do their thing, rolling them off really steeply – 24dB per octave – below 30Hz. (Which I checked by whipping out my stupidly low ‘Bass CD’ from the car audio world – the track called Woofer Excursion Test, if you’re interested). The Utopia Sub EM’s potential output is rated at only three decibels down at the low zone of just 22Hz (called the ‘F3’), so single-figure cycles will still only be at the F6 and F9. Thus, while the system could do it, with two kilowatts of amplification as backup, the pair of subs had been setup with one hand tied behind their backs. I was told it was heavy work to reprogram. A shame, as I still want to get at one of these on their own. At the heart of the Focal Utopia lineup is the brand’s own transducers, astonishingly brilliant for many reasons across the whole audio passband. First the 8in woofer, dubbed W. Here, a superfine weave of glass cloth is used as each face of the ‘W’ cone. Inside is now a foam – it used to be tiny glass beads and resin – and the damping, rigidity and lightness qualities are awesome, be it the 8in bass driver in the Viva Utopia, the 13in iteration in the EM sub or the Utopia’s 6.5in midband ‘Power Flower’. The latter gets its name from the mad-looking magnet structure behind the cone. It uses pucks of magnetic material and rare earth samarium-cobalt elements, as well as neodymium in its make up. This slick slice of metallurgy equates to real huge grip in the magnet gap – and the solid anodised alloy plug in the middle of this driver is an integral part of how it works. I could rabbit on for years about the tweeter's extraordinary geek tech but the most important fact is that they’re constructed from pure beryllium – a lightweight metal offering exceptional stiffness. This is formed into a dished-in dome, supported on a clever and wobbly suspension and damped with a back chamber. The 1in tweeter is mounted along with the ‘Power Flower’ midrange driver in a separate, centrally-positioned enclosure that’s free from interaction with the two adjacent bass units. This centre cabinet is reflex-loaded by two foam-damped ports that exit to the rear. These resistively-loaded ports help maintain the linear operation of the drivers as sound levels increase, preventing the early onset of compression. On the subject of mad magnets, the subwoofers arrive with a naughty-looking outboard box. This is the power supply to drive the electromagnetic circuit on the back of the driver. Like the sort of magnets that can keep a bank robber locked in the porch of the bank, the drivers in the Utopia EMs are in the electromagnetic grip of an iron fist in a velvet glove. This is quite separate to the LFE signal feed going to the amplifier, and these off-board boxes each feature a single knob used to alter the degree of electro-magnetic force in the gap. I immediately grasped this idea but have never seen it before. Awesome. The subwoofers utilise a classic design – a ported box firing out of its front. The Viva Utopias are more sophisticated, and are in fact a triumvirate of enclosures, separate yet joined, all feeding from a single, simple set of just two binding posts. No bi-amping options here. Focal’s big thing is that its drivers are so perfectly designed for purpose that they only ever use really minimalist passive crossovers inside, meaning there’s less internal tech to soak up power, colour the sound or mess with the phase and so forth. The top and bottom chunks of the floorstander, with the 8in W cones, have a port each, and, because the three boxes are held splayed to point each driver to a single acoustic focal point a few feet in front of the listener, there’s a space between them for the driver’s port to be acoustically loaded against the wall of the next box. This will improve power handling. I played the Pixar short Lifted – a clip I cannot avoid at this level – and the Focal array’s sheer power beauty, placement, homogeneity and control left me reeling. I found myself plonked in the middle of a full-size and unbelievable spaceship, ears delighted by the most delicately sweet sounds – with edges of soft susurration – like a spoon tinkling in a glass. The Focals have the ability to raise utter mayhem, while at the very same time have no issue whatsoever with exquisite background details. Whatever lurks in the movie soundtrack you’re guaranteed to hear – or rather, experience – it all. The skydive-from-space sequence in JJ Abrams’ Star Trek prequel yielded similar reference-grade results. The jump starts with nothing but our heroes’ stertorous breathing in their spacesuits. I am a second-class diver and so help me – it sounded real. I mean real. Then we race through the atmosphere and land with force upon the platform with the roaring planet drill, and the speakers’ bass drivers proved their mettle. Then, with the aid of the beryllium tweeters, Sulu’s Katana sword extends with an almost painfully cutting schwing. This 5.2 system grasped me by the kidneys, by my very heart and soul. It ranks at least as fabulous as Bowers & Wilkins’ Diamond-tweeter touting 800 Series and, sadly for KEF, is more amazing even than its exceptional Reference system. And that’s saying something.